Canucks get five bucks FREE at LV! Yes, you read that right, leading European online casino LV BET is inviting plucky Canucks to spin for FREE. And we mean totally free, on a massive choice of slots. Their friendly team will credit you with five bucks, just like that. Be aware that it’s a manual process, so you might need to wait up to 24 hours to get your bonus, and it does come with the expected terms and conditions. The main ones to keep in mind are a 50x wagering requirement, US$100 max win, and a 3-day validity. 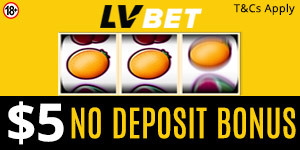 So you’ve had a blast with your free five bucks and want to get serious at LV BET? Great, because Canadians can get a Welcome Package worth up to US$1,000. Yep, that’s a big fat three zeros especially for the politest people on the planet! When you make your first deposit you’ll get a 100% bonus up to US$200. When you make your second you’ll get 50% up to US$200. On your third you’ll get 25% up to US$500, and finally, on your fourth you’ll get 200% up to another US$100. That means you can get up to US$1,000 in total. Now, that’s a lot of extra spinning! Again, of course, there are terms and conditions. The main things to look out for are wagering requirements, which is 30x, except for the 200% one which is 35x. The four deposits must be a minimum of US$10 each, and made within 90 days of registering, and each bonus is valid for 15 days only. Note that both offers come with certain game exclusions, other restrictions, and are subject to LV BET’s General Terms & Conditions. So take a break from the ice hockey, grab a Tim Horton’s (other coffee’s and donuts are available, apparently), and explore a world of gaming at LV BET today! Go on and read our LV Bet review today and redeem your CA$5 free no deposit bonus.